Today Microsoft announced the availability of Windows Azure SDK 2.0 for .Net. You can read more about the announcement in Scott Guthrie’s blog post here:http://weblogs.asp.net/scottgu/archive/2013/04/30/announcing-the-release-of-windows-azure-sdk-2-0-for-net.aspx. In this blog post, we’ll cover some of the features introduced in this newest version. You can download and install SDK 2.0 using Web Platform Installer from Windows Azure Developer center: http://www.windowsazure.com/en-us/develop/net/. IMO, this is the most important improvement in the tooling. 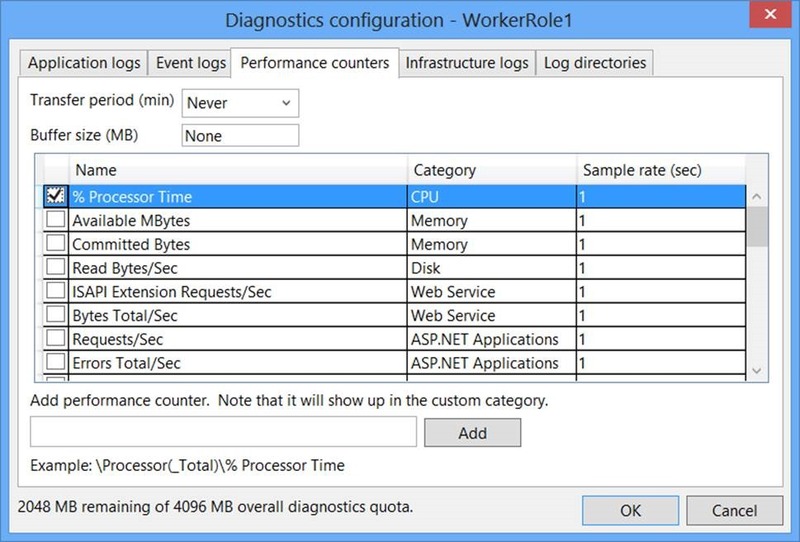 Windows Azure Diagnostics (WAD) is a crucial part of any cloud service deployment and unfortunately it was really tough to get diagnostics working. In the latest version, the tooling team has made it extremely easy to manage WAD. You get an easy to use way of configuring diagnostics. See the screenshot below for example. You get 3 options – “Errors only”, “All information” and “Custom plan”. When you choose “Errors only”, only log entries (trace, event, and infrastructure) with “Error” type will be transferred to storage. When you choose “All information”, all logs entries will be transferred to storage. Please note that in both the cases the transfer interval is one minute and performance counters data will not be transferred. If you want to transfer performance counters data or wish to have more granular control, you would need to choose “Custom plan” where you would be able to configure not only performance counters but also scheduled transfer period and buffer size as well among other things. Another important change with WAD is that it is no longer dependent on Storage Client Library 1.7. It makes use of version 2.0.5.1 of the storage client library. I’ll probably write another blog post focusing exclusively on Windows Azure Diagnostics and SDK 2.0 to cover that in more details. 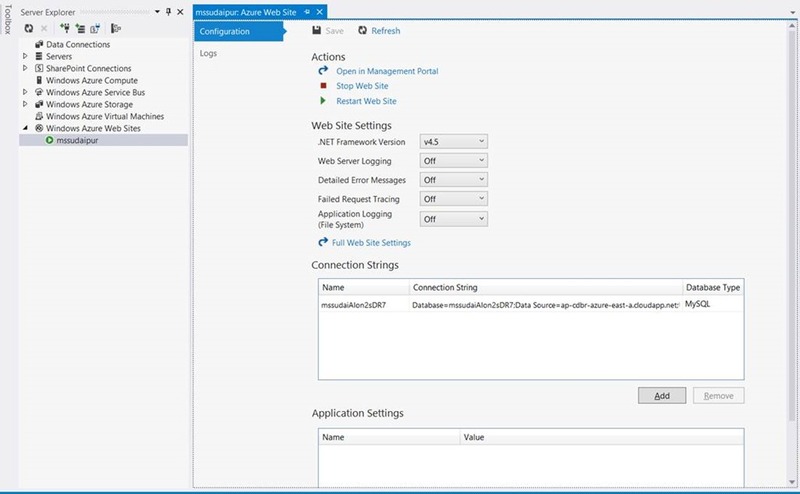 Now you can view and manage Windows Azure Websites through Visual Studio. To manage your websites, you would go to VIEW à Server Explorer à Windows Azure Websites. There you will see all your websites. You will need to provide a publish profile file before you can use this functionality. · Manage configuration – as shown in the screenshot above. · View / download website logs. · Improved publishing support. Unfortunately you can’t create a new website through Visual Studio just yet. When Windows Azure Virtual Machine (IaaS) went GA a few days ago, they made 2 new VM sizes available there (A6 and A7). They’re now available in Cloud Services as well i.e. you can deploy cloud services in A6 and A7 sized VMs as well. You get that option in Visual Studio as well. SDK 2.0 by default includes latest version of various libraries which at the time of release was 2.0.5.1 for Windows Azure Storage, 2.0 for Windows Azure Service Bus, 2.0 for Windows Azure Caching and 2.0 for Windows Azure Configuration Manager. You can also get these libraries from NuGet as well because these libraries will be constantly updated with latest features in between SDK releases. Windows Azure Service Bus client library has been updated with support for browsing messages, the event-driven message programming model, and auto-deleting idle messaging entities. The minimum version of the .NET Framework required for building web and worker roles is now .NET Framework 4.0. You can still reference .NET Framework 3.5 assemblies in your project, but the project itself must be built targeting .NET Framework 4.0 or 4.5. Furthermore ServiceRuntime, Configuration and Caching assemblies are now built against the .NET Framework 4.0 runtime. Therefore, any of your applications that target the .NET Framework 3.5 should now target the .NET Framework 4.0 before upgrading to the Windows Azure SDK for .NET 2.0. Side-by-Side cloud service debugging is only supported with Windows Azure SDK for .NET versions 1.7, 1.8, and 2.0. For a full debugging experience, projects built using versions prior to version 1.7 must be upgraded. This is done in line with the SDK expiration policy announced some days back. That’s it for this post. All in all I am quite pleased with the changes introduced in the new SDK and I think they will help users working with Windows Azure immensely. 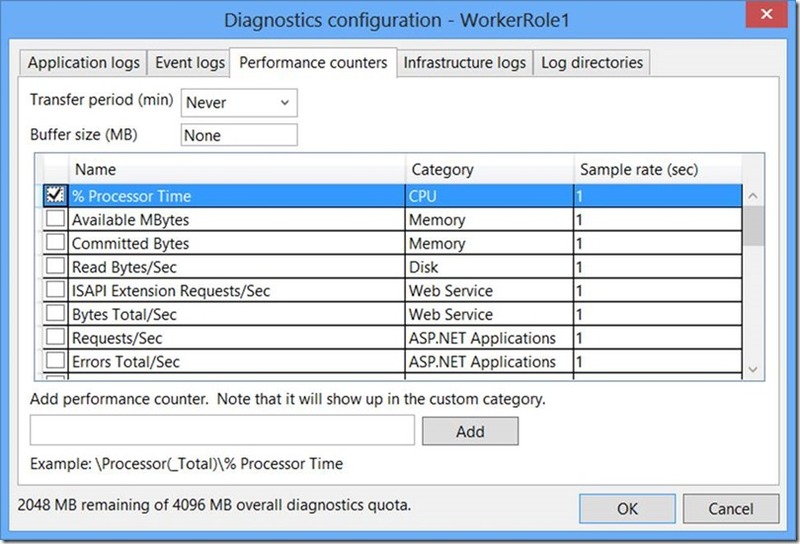 In the next post, I will dig deep into Windows Azure Diagnostics and SDK 2.0.